Today, several members of Living Water Lutheran Church in Springboro, Ohio, hit the bricks to share God's love in a practical way, giving away 168 bottles of cold water to total strangers in less than an hour. One member brought her grandsons. When one of the boys saw an elderly man filling up his gas tank at a Speedway station, he asked his grandma if they could share a water with the man. I'm convinced that the young man was responding to a prompt from God's Holy Spirit, because when he and his grandmother had given the water to the man, he was deeply touched. "Are you the kind of church that prays for sick people," he asked. "Every week," he was told. He then asked if they could pray for his wife, suffering from a terminal illness, and who he hoped to bring home before she passed. The group of three began to pray, right there by the pump at the Speedway station. As it happened, a veterinarian, whose office is near the station, saw the praying group, walked over from his office, and asked if he could pray with them. The comfort of God came to a man carrying a world of hurt and grief. A little boy learned to respond to Jesus' call to love others as we love ourselves. The group of us on this outreach learned again that God uses those willing to follow His lead to spread the message of His love in our communities and in our world. "That's an easy play," said Reds broadcaster Thom Brennaman. Not when you're trying to make it on Billy Hamilton! "My relationship with northeast Ohio goes beyond basketball. I didn't realize that four years ago. I do now." 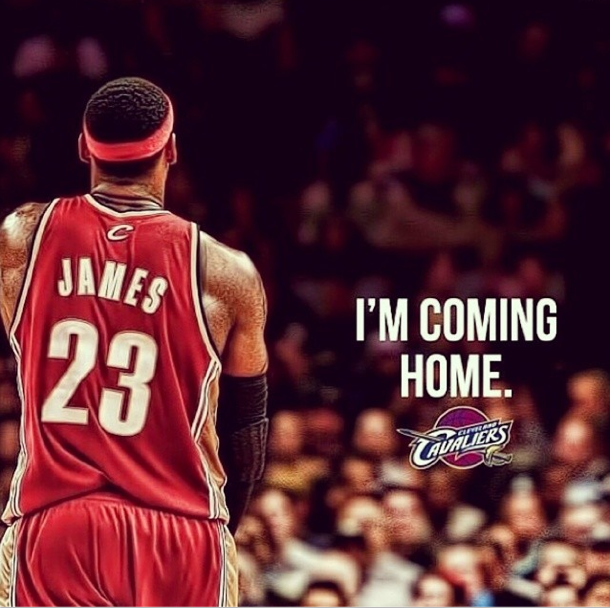 That's part of LeBron James' explanation of his decision to go back to Cleveland. It reminds me of the old saying, "You don't know what you've got till you lose it." That feeling can come to any of us. But not everyone gets the chance to return to the place or the people that constitute "home" for them. James has gotten that chance. Good for him! "What could happen if we in God’s kingdom truly acted as if the words of the apostle John were literally true: 'He who is in you is greater than he who is in the world' (1 John 4:4) [?]" It would be "reverse paranoia." Very helpful post by Philip Yancey in today's Our Daily Bread, here. We were really impressed by South Bend shortstop Andrew Velezquez. The kid turns twenty this coming Monday. He went 1 for 2, with two walks. The At Bat on which he got the hit was an impressive one. After fouling off a number of pitches, he connected for a hit to right field and, with his exceptional speed, turned a double into a triple. In his other official AB, what looked like a sure home run veered slightly into foul territory. Velezquez did commit a fielding error. But I think this kid will be in the bigs some day, probably sooner than later. Tried this last night and had fantastic results. The ear slips out of the husk, with the silk left inside, like toothpaste from a tube AND the corn tastes great! The takeaway, I think, is that there are inherent potential negatives for churches of any size. But armed with these facts, churches can prayerfully avoid the negatives and be all that God calls them to be. Today, our topic is true wisdom. True story: An then middle-aged white woman, a longtime follower of Christ and a devoted student of the Bible, went with women from the Methodist congregation to which she belonged to visit a group of African-American women who were members of an inner city church. They were to have a Bible study together. The woman supposed that she and her group would do a lot of teaching during the gathering. She and the other women of her group were amazed though, by one young black Christian whose love of Scripture and, more importantly, her depth as a follower of Jesus Christ, taught those white women more about what it means to be a disciple in a few hours than they had learned for much of the rest of their lives. Decades later the middle aged woman, by then elderly, told a little boy who, more than twenty years later, God would, call to be a Lutheran pastor, to never confuse Bible knowledge for faithfulness, to never confuse learning about the Lord (or learning about anything else, for that matter) for wisdom from the Lord. I've never forgotten those words spoken to me by my great-grandmother. Knowledge and worldly wisdom come from us; but true wisdom comes from God alone. And if we take our cues from the world and its ideas about what’s shrewd and smart and wise, we will end up on the wrong side of eternity. Nowhere is this more true than in the usual responses of the world to Jesus Christ. Though the human race may not like it, Jesus, both the Bible and Jesus Himself insist, is the only way to life with God. And five hundred years ago, Martin Luther distilled it by saying that if we want to know God and Who He is, we need to look to Christ on the cross. Jesus is the window to God, the doorway to eternity, God come to the earth, Who is our only means to eternity. You may have noticed that the world isn’t always keen to accept these things about Jesus. Accepting Jesus as the ultimate self-disclosure of God and the only Savior of human souls doesn’t play well with the prevailing prejudices of the human race. One such prejudice challenges God in Christ to prove Himself, His existence, and His power, as though His death and resurrection are insufficient proof to silence all challenges to Jesus’ lordship. Another prejudice comes from those who prefer that God be subordinate to them and let them choose religion over faith in Christ alone. Then there are those who simply hate the idea of surrendering to a God Who offers them salvation as a free gift, who want to prove themselves and their own worthiness, who want their will to be done and not God’s will. Truth is, we all exhibit these prejudices, even the most committed of Christians. Bred deep in the DNA of every human being is the desire to be like God and the suspicion that we know better than God. And this inherited “functional atheism” will reside in every human being until the crucifixion of death comes to this earthly flesh. In the section of Matthew’s Gospel from which this morning’s lesson comes, Jesus has been running the gauntlet of these human prejudices, through the kind of human confidence in human wisdom that often keeps human beings from trusting in Christ as God and Savior. Take a look at Matthew 11 with me, please (page 682 in the sanctuary Bibles), and scan the incidents that give rise to the prayer of Jesus that makes up today’s lesson. John, being of a religious bent of mind, was confused. He thought that the Messiah would be a conquering king. But here the One he thought was Messiah was operating as God always had stretching back to the garden and throughout the Old Testament, offering salvation by grace through faith in Him. Later, in verses 16-18, Jesus laments the fact that “this generation,” meaning the whole human race, could never be satisfied with the ways in which God reached out to them. They said that John the Baptist, who never touched a drop of alcohol, had a demon and that Jesus, because He reached out to tax extortionists and other sinners, was “a glutton and a drunkard.” The religious know-it-alls, the good church people of Jesus’ day, were certain of their wisdom. Despite his doubts, John the Baptist was willing to submit to death for His faith in Christ, and so was proven right. Jesus, despite His sinlessness, was willing to take our punishment for sin on the cross, then rose from death to offer life to all who follow Him, and so was proven right. And, the Bible teaches, if we will follow Him, we too will be proven right in trusting in Him. This way of life is completely opposite to the way of life commended by the world’s wisdom. The people who get the Gospel, who get Jesus and get life from Him are those who are willing to get Jesus, people who submit to becoming little children and who bow to the wisdom of God. Jesus isn’t saying that those who follow Him are to be stupid or gullible. He’s saying that they are pliant, open to God. In the end, faith in Christ and deepened faith in Christ cannot come as the result of human wisdom or rational argument. Faith cannot come from the begrudging fulfillment of religious duties, of taking on the burden of religious do’s and don’t’s like the heavy yoke the farmers of Jesus’ day placed on the backs of their work animals. Faith and the new life of freedom from sin, the freedom to say no to sin, the freedom to live as the people God made us to be, the freedom to live life God’s way, the way we were designed to live, is a gift to those who turn their backs on the wisdom of the world and embrace the wisdom of God. Of course, we must learn as Christians to live in this world like foreigners and strangers. We're not in heaven yet. That's why Jesus says that His followers are to be as wise as serpents and as innocent as doves. But we are people who live under a new wisdom, unlike the wisdom of this world. We know that grace is free. And rest for the soul comes to those who follow Christ. To some, heedless of Christ’s cross and empty tomb, these words will seem like nonsense. They will refuse to believe. And the only way to reach them is the very way Jesus reached skeptics and unbelievers, through deeds of kindness and love and service rendered in the power and in the Name of God Himself. That’s why our missions to places like India and Haiti, our service through agencies like Service Over Self, Interfaith Hospitality Network, and the Gateway Men’s Shelter of St. Vincent de Paul, and even our kindness outreaches, are so important. Romans 2:4 tells us that the kindness of God is intended to bring people to repentance and new life in Christ. Christians, living in the wisdom revealed by Christ and not in their own wisdom, are freed from all anxiety about their own worthiness, so that they can perpetrate many small and large acts of kindness in Christ’s Name and Christ’s power and so, recklessly help others know the God of the cross and the resurrection. This actually should be very good news for us this morning! Confession: The older I get, the less I can truly say I know. My head may be filled with lots of facts. I may have lots of experiences. But as time goes by, the less qualified I feel to function myself or to offer advice to others. My wisdom, I realize, is non-existent. My impulses, doubtful. My maturity, questionable. But despite having nothing of what the world counts as wisdom, I live with confidence and hope. I know that God has all the wisdom I need to live from day to day. And from God, we can have the greatest wisdom of all: faith in Christ! This is what Jesus offers to those who submit to being little children who follow Him. Jesus has chosen to reveal God and the way of salvation and hope to those who are willing to surrender. You don’t have to be brilliant or charming or strong or beautiful or accomplished. You just have to be willing to let Him love you and follow where He leads. I have to warn you that that sounds easier than it actually is. Which is why the Christian lives in what Lutheran called “daily repentance and renewal,” daily surrender to Christ, daily downloading of God's wisdom.